All right, I have to confess something: I am HUGE thoroughbred racing geek. Massive. I wept for a solid hour or so when American Pharoah crossed the finish line in the Belmont on June 6th, winning the first Triple Crown in 37 years. 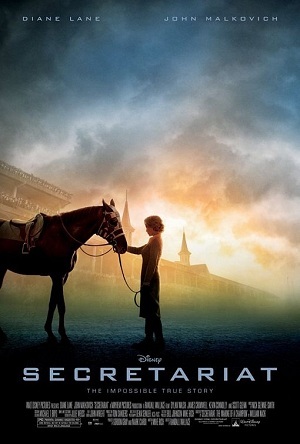 The day of the Belmont I happened to watch Seabiscuit (unfortunately with commercial breaks) on basic cable and it got me thinking about my top five thoroughbred racing movies. Clearly, I have seen every single one out there, but, of the ones I have, these are the ones I would recommend to you. I saw this film at the theatre along with my husband; we were probably the youngest people there! This movie is adapted from Laura Hillenbrand’s book of the same name, chronicling the life of the little horse that could, who beat the famed War Admiral, Triple Crown winner and son of Man O’War, in a match race in 1938. The United States was coming out of the Depression, World War II was looming, and Seabiscuit became a hero for the common man as he built a career that no one thought he would have when he was younger. I’m still not a total fan of Tobey Maguire as Red Pollard; his Spider-Man was decent, but it felt like Maguire overacted at certain points. However, the movie does a great job of hitting the high points from Hillenbrand’s book and giving the viewer a decent overview of the lives of the horse and his connections. My parents will be amazed that this one isn’t number one on my list. 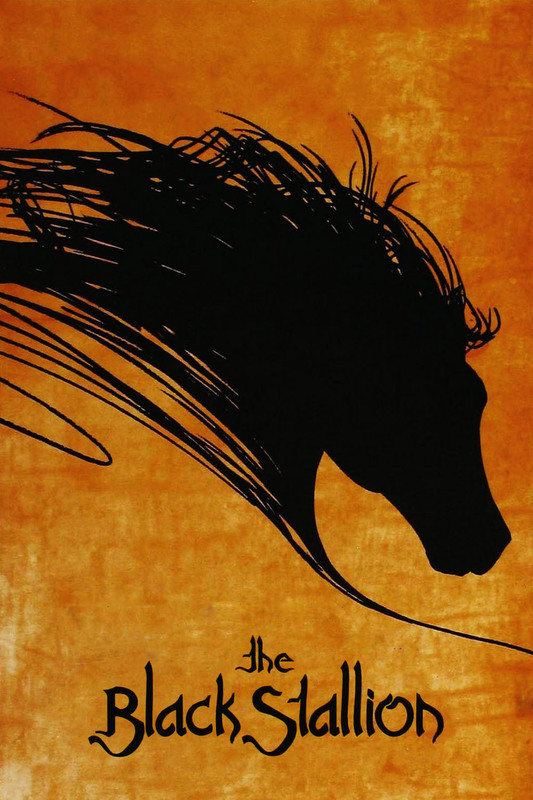 When I was in fifth grade, my teacher read Walter Farley’s book The Black Stallion to us. I fell in love and I fell hard. I became obsessed with the books and then thoroughbred racing, which is kind of funny because the nearest thoroughbred racing to Alabama is in Arkansas, Louisiana, or Kentucky. When I discovered that the book also had a movie adaptation, I was at the nearest rental store, still a fledgling thing in those days (this was 1988), every week, renting the movie on VHS. The film, with Francis Ford Coppola was executive producer, had a tiny cast, opting instead to focus on the handful of characters central to the titular horse, the Black. The biggest name in the cast was Mickey Rooney, who played trainer Henry Dailey, and Terri Garr, who played Alec Ramsey’s mother. In terms of an adaptation, it is quite faithful to its source material, though it does take liberties with the circumstances of the shipwreck that brings the Black and Alec today. Visually, it is one of the most beautiful films I’ve ever seen, especially the race sequences. It’s hard to film horses running in a race; we are now fortunate to have all sorts of technology to capture a variety of angles, but trying to get close-ups when the horses are running upwards of 40 miles per hour and keep everyone safe is a challenge. Like Seabiscuit, this film does the racing sequences very well and maintains the excitement of an actual race. 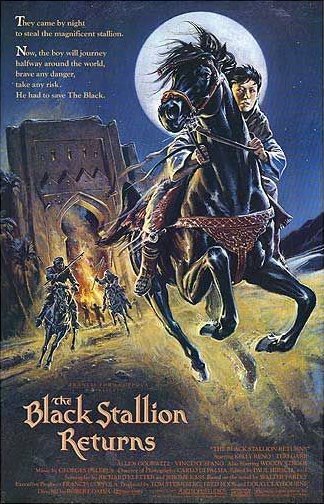 I enjoyed this movie because it was another Black Stallion book on film and, on its own, it’s a decent movie, but the changes to the book’s plot were made in favor of creating a more exciting film and, instead, it comes off as missing certain pieces of information in order to understand exactly what’s going on. The story gives you enough to get you through, but someone who hasn’t read the book might not enjoy as much as someone who has. However, visually, this movie is again quite lovely, especially the climactic race across the Arabian Desert. The film has no real big-name stars in it, which allows the viewer to focus on the story and the characters a bit more rather than looking at an actor and thinking, “Hey, where do I know that guy from?” While this one may not be good as the original, it is definitely a nice companion to the book of the same name. 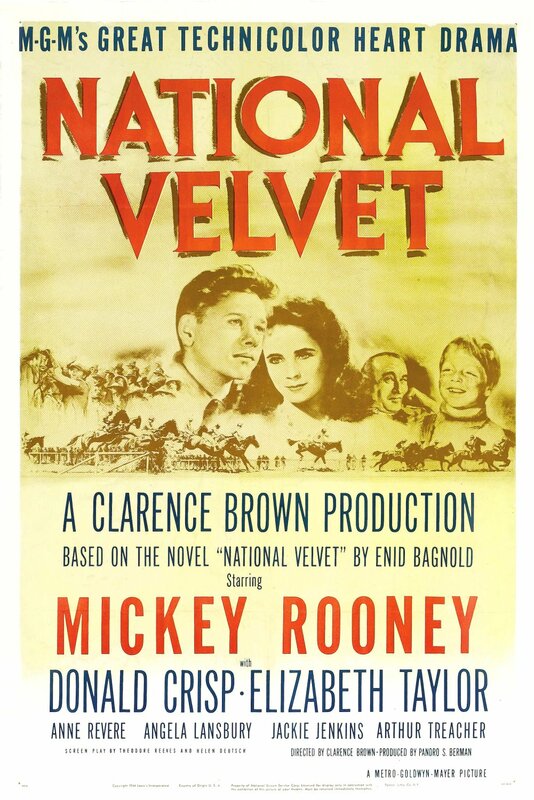 Rather than focusing on the flat racing that so many Americans associated with thoroughbred racing, National Velvet is centered around a young girl Velvet Brown (Elizabeth Taylor) who wants to ride her horse, the Pie, in England’s Grand National Steeplechase. She wins the Pie in a raffle and convinces Mi (Mickey Rooney) to help her train the horse for the Grand National. As the race approaches, Velvet takes it upon herself to ride the Pie in the race rather than allow a doubtful jockey to ride him; she has to pose as a boy to ride, since women were not allowed to ride competitively. Velvet and the Pie win the race, but, when she realizes that they’ve won, Velvet faints and falls off the horse. As the medical staff tends to her, race officials discover she is not a man and disqualify her and the Pie as winners. The movie is great for kids of all ages who might be into horses and interested in horse racing; in the style of movies from this era, it shies away from the seedier aspects of the sport in favor of feel-good storytelling. Elizabeth Taylor, who was a teenager when she made this movie, is lovely as Velvet, though, for modern audiences, she might come off as a bit melodramatic. However, it’s a classic for a reason and definitely is one that I would recommend watching. This Disney film, based on the book by William Nack, chronicles the aftermath of death of Penny Chenery’s father and her attempts to balance running her family’s Meadow Stables in Virginia and her own household in Colorado. Though the stable had a Kentucky Derby winner and champion horse Riva Ridge the year before, the film focuses on the circumstances surrounding Secretariat and his rise to the Triple Crown and the pinnacle of racing in 1973. Diane Lane does a decent job playing Mrs. Chenery, but the film feels predictably Disney-fied. Turning a book into a movie requires excising quite a bit of material, especially with a true story, but Disney adds an element of forced inspiration. Chenery does something extraordinary for the time, as a housewife who also happens to run a major thoroughbred racing stable with classic contenders, but the interplay of conflicts between her, her husband, and the responsibilities she’s taken on becomes the focus at times more than the intricacies and pressures of having a horse with high expectations. 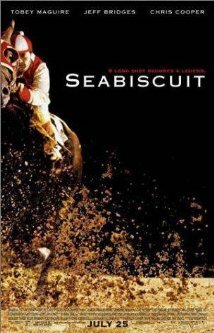 That’s not terrible, but I’m not as high on this movie as I was on Seabiscuit. Nack’s book of the same name is great read if you watch the movie and want more. 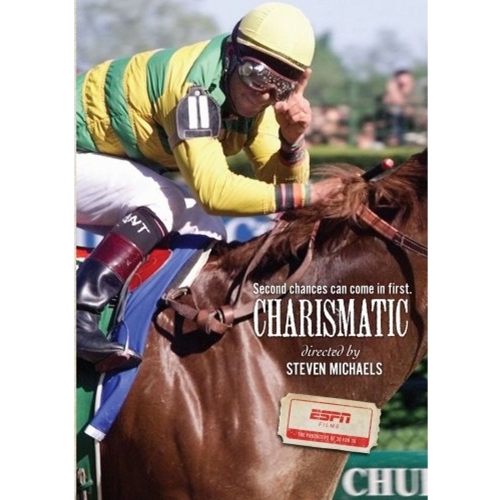 In 1999, Charismatic became another one of those horses who almost broke the Triple Crown drought. Just seconds from victory in the Belmont, his jockey Chris Antley discovered that the horse was injured and pulled him up, holding the colt’s leg to prevent further injury, which might have necessitated euthanizing Charismatic. This episode of ESPN’s excellent 30 for 30 series covers this story of an unlikely champion and his story of going from nowhere (sort of like Seabiscuit) and reaching the top of the horse racing world before an injury steals his shot at greatness. It’s a great watch, especially considering the up-and-down career of jockey Chris Antley, who was recently inducted into the National Museum of Racing and Hall of Fame. All of these titles are available on Amazon Instant Video or DVD. This entry was posted in Jennifer, Other Stuff and tagged Horce Racing Movies, Movies About Race Horses, National Velvet, Seabiscuit, Secretariat, The Black Stallion, The Black Stallion Returns. Bookmark the permalink. PharLap is a must se if you have not already. I’d have struggled to think of five horse racing movies so you’ve done well here. Is it bad that I haven’t seen any of these? Nah. Now you have a chance to seek them out and try them!